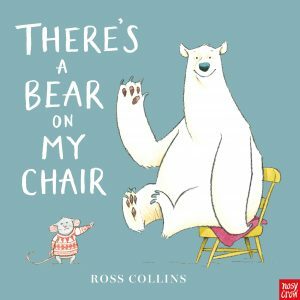 Ross Collins wins the 3 to 6 category of the 2017 UKLA Book Award. Strong rhythm and rhyme, interesting words and humorous pictures work well together in this book. Differing font size and colour express tone, emphasis and volume. This is a good one for reading aloud. A range of emotions is shown in the illustrations. The facial expressions of the bear and (especially) the mouse are richly conveyed, yet simply drawn. This is a good example of economy of line where a simple tilt of ears or a jagged whisker can convey outrage, exasperation, despair, determination, cunning, or dejection. Fans of Jon Klassen and Kes Gray, and readers who enjoy an amusing little twist at the end of the tale, should enjoy this book. The winning book in the 7 to 11 category is The Journey, written and illustrated by Francesca Sanna. The winning book in the 12 to 16+ category is The Reluctant Journal of Henry K Larsen by Susin Nielsen. The UKLA (UK Literacy Association) Book Awards are the only awards to be judged entirely by teachers. “For UKLA, giving classroom practitioners the opportunity to read a number of new quality children’s books is as important as finding an overall winner. Research carried out by members of UKLA (Cremin et al 2008) clearly demonstrated the links between teachers’ knowledge of children’s books and the likelihood of pupils becoming successful readers.” Check out the UKLA website (ukla.org) for lots of free resources. Posted on July 3, 2017 by Mandy Williams. This entry was posted in Book awards and tagged Book Awards, Primary, Secondary. Bookmark the permalink. Yea. I loved this book. Well deserved. But some strong competition. Welcome to the Curriculum Centre's blog on children's literature. The blog is designed for trainee teachers in the School of Education at the University of Brighton and aims to keep students up to date with new and recommended children's books for use in their teaching practice. The blog also aims to encourage the use of children's literature to make links across all subject areas. Search for resources using our library catalogue.